سواءً كنت مسافراً بغرض السياحة أو العمل, فندق جراند تشانسلر هو خيار عظيم للإقامة خلال زيارتك هوبارت. يمكن من هنا للضيوف الاستمتاع بسهولة الوصول إلى كل ما تقدمه هذه المدينة النابضة بالحياة. بالنسبة لمن يريد الخروج، هذه بعض المعالم السياحية المتوفرة للزوار The Good Pirate, تاسمانيان ارت جالري, فكتوريا دوكس. استمتع بالخدمات الراقية والضيافة التي لا مثيل لها بهذا الفندق في هوبارت. تتضمن الميزات الرئيسية في هذا الفندق: خدمة الغرف على مدار الساعة, مكتب الاستقبال على مدار الساعة, مرافق مخصصة لذوي الاحتياجات الخاصة, تسجيل وصول/خروج سريع, تخزين الأمتعة. ادخل إلى واحدة من الغرف 234 وتخلص من عناء نهار طويل بمساعدة مجموعة كبيرة من الخدمات كمثل تلفزيون بشاشة مسطحة, رف للملابس, مناشف, غرف لغير المدخنين, مكيف هواء الموجودة في بعض الغرف. صممت خدمات الاستجمام في الفندق والتي تتضمن مركز للياقة البدنية, ساونا, حمام سباحة داخلي, تدليك لمساعدتك على الاسترخاء والراحة. مهما كانت أسبابك لزيارة هوبارت، فإن فندق جراند تشانسلر هو الخيار الأفضل لإقامة مثيرة وممتعة. يتكلف استخدام مهد الطفل في الليلة 10 USD. The best part of a stay here is the captivating view, overlooking the cruise ship berth. There was an enormous one anchored while we were staying, and it added an extra dimension to our holiday photographs. While we didn't dine at the hotel restaurant, it didn't seem too outlandishly expensive for a luxury hotel. Staff were polite and efficient. Bonus is the Skybus stop right outside which makes getting to the hotel and back to the airport effortless. We booked a premium room with mountain view and were a little disappointed to really see just city roofs so got online to check how much it would be to upgrade to seaview and found the prices of the seaview rooms had gone down cheaper than what we paid for the mountainview so went down to the reception and asked to be upgraded. They went above and beyond and upgraded us to a Premium suite and of course we could not have been happier. Will definitely stay here again. My room (1208) had a superb view over the harbour. Working desk + light were good, bedroom and bathroom spotlessly clean and well-equipped. Swimming pool is a bit small and not well-designed so when doing laps, large waves form. Staff were very helpful and a late night glass of wine by the fireplace in the lobby was pleasant. The staff were very friendly and helpful, little or no waiting times for attention at the front desk. Hotel room was immaculate, comfy bed, great views and amazing shower! Couldn’t fault it, I had a wonderful stay here, will definitely be back. Stayed for 2 nights arriving late, woke up to beautiful views of harbor. Twin room had double beds and arranged porta cot for baby. All the staff were so helpful and friendly assisted with pram from basement carpark. Plenty of good restaurants in walking distance. The location in front of the pier is excellent, fresh fish & chips just minutes away. Looking out the window to a wonderful view every time. Grand Chancellor is center of everything... the bus to bruny island is close, the salamanca market is nearby and so is the battery point. Parking is extra but its not bad. I love the view of the harbor and the service is fantastic. The free bike is a GREAT GREAT GREAT add on! Let me start off with saying that the bed and pillow was extremely comfortable, one of the better sleeps I've had in a hotel and one of the more important things to rate a hotel for! The gym had enough equipment for a decent workout and it has onsite car parking for a decent price. 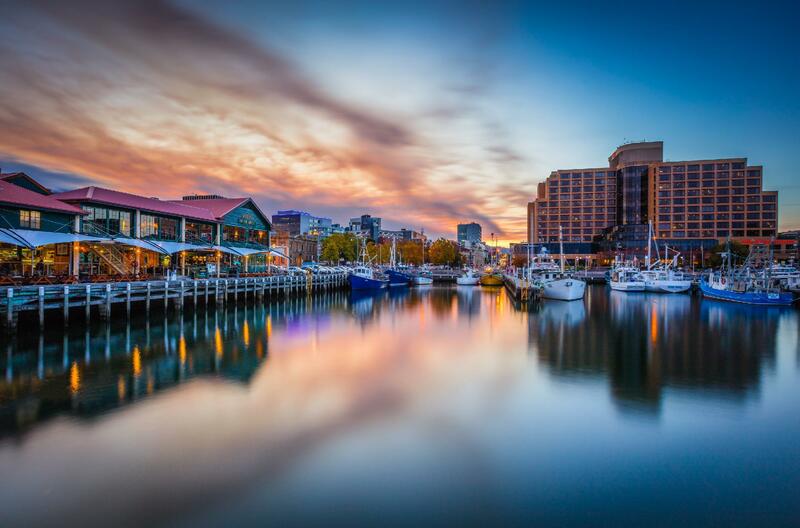 Lastly the location on the docks was fantastic, providing easy access to the Taste of Tasmania, those wanting to catch ferries to MONA as well as a lot of good choice of eateries. I would highly recommend a stay here. Friendly and helpful staff from front desk to room service. Instead of taken taxi to airport, front desk staff suggested that we can use private driver service at stand by price similar to taxi services. The private hotel car services is to be recommended at standby rate. Value for money. Great location with water view. We booked city view and was upgraded to water view. Thank you front desk staff for a lovely unexpexted surprise! I would recommend this hotel. Very good bed and comfortable room with good facilities. Two issues were the TV was very poor with an extremely average picture and the internet offering was not up to the standard available in similar hotels. Expensive and poor speed. Location, spacious room, friendly staff. Spent two nights at the Grand Chancellor Hobart, very good location, with plenty of restaurants close by. Also a short walk to the Salamanca Market and shopping area. There is parking available but it is not complimentary, at $9 a day it's acceptable. Wifi is also available in the rooms. Fantastic harbour views, comfortable bed and great bathroom. Good value for money! Friendly staff. Stored luggage when we arrived early. Bathrooms could do with an upgrade. Were told we were being given a quiet room because we were staying over a week. It was quiet until 4.30a.m on our last night. A drunk kept trying to get into our room and wouldn't go away. Ended up calling reception to sort him out. Could not get back to sleep. A disappointing end to an otherwise pleasant stay. Hotel was well maintained, located in a very central area that is walking distance to many eateries and the supermarket. The only downside is the sound-proofing of the room. We can hear footsteps, people talking and doors banging outside our room. The window needs to be sound-proofed as well as it can get quite noisy in the day when there is peak traffic and the room is just above a busy road section. All the staff were super lovely. Went above and beyond to make my surprise stay for my partners 30th birthday, an amazing one. Everything was clean and tidy. Just couldnt fault the place.